Looking for a good touring helmet, but not looking to spend the equivalent of large state’s GDP to procure it? Well, we’ve got good news for you and your conundrum. Enter the Scorpion EXO-T510 Helmet. 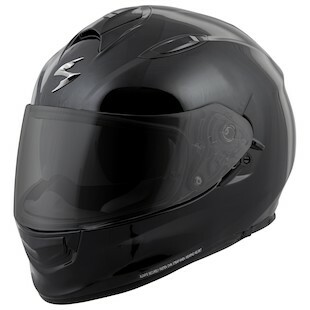 A budget-friendly touring lid replete with drop-down sun visor, comfy innards, and plenty of high-tech features for the discerning motorcycle rider. The EXO-510, Scorpion’s new polycarbonate full-face helmet, comes to us with a few tried-and-true features, and a few new ones to boot. Their famous Air-Fit system is present, as is their KwikWick II antimicrobial liner fabric and their Kwikfit cheek pads. Methinks someone’s copywriting staff needs a dictionary. The Ellip-Tec makes face shield changes a breeze, as does the Aero-Tuned Ventilation. See what I did there? To round things off, both the 510’s face shield and drop-down sun visor come with an optically-clear, antifog, and scratch-resistant coating. Breathe easy (or heavy), either way you won’t run into any trouble. If you like premium features, but your wallet disagrees, the Scorpion EXO-510 can fill a very important spot in your gear closet. Sun visor, good venting, and eyeglass-friendly cheekpads, oh my!